Founded in 1981 by Stanley Tanger, Tanger Outlet Centers are located in 23 states with 2,000 brand name and designer outlets. 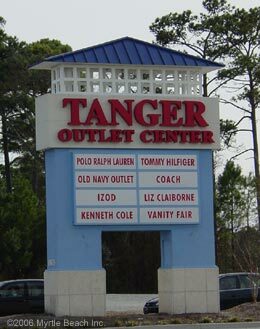 There are two Tanger Outlets in the Myrtle Beach area. One is located by the Intersection of Highway 22 and US 17, and the other is located on Highway 501 between Myrtle Beach and Conway. Vacationers frequent these conveniently located designer outlets, and both of these shopping venues are also enjoyed by locals year-round.